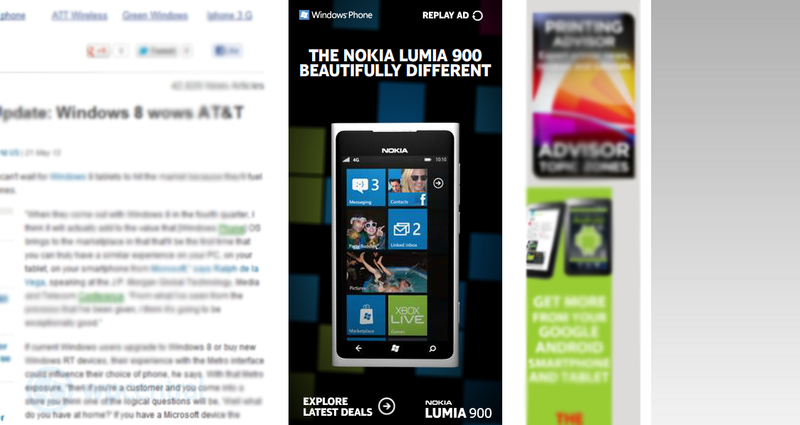 We're not to sure what to make of this ad for the Nokia Lumia 900 showing up on some sites but it caught one of our reader's attention and indeed, it is intriguing. The ad is simple enough. It shows the 'beautifully different' Lumia 900 in glossy-white with a 4G icon (this is for the international version, not AT&T) spinning around, displaying various features. Contacts - The tiles flip and it says "Meet up with Sarah"
Anyone who has used Windows Phone, any version, knows very well that the Live Tiles do neither of those things. Yet there they are flipping around like they belong there are a new ad. Now we could easily chalk this up as some marketing error, a glitch made by someone getting Photoshop happy and not accurately representing Windows Phone 7.5--and to be honest, there's a good case for that theory. Or perhaps we're looking at something else, maybe something along the lines of Windows Phone 8 behavior. After all, those are small enough changes that also make tremendous amount of sense for "new features" in an updated OS. No real way to know of course but if this isn't a Windows Phone 8 leak then Microsoft, you should probably make those changes because they're quite nice. And if a mistake, Nokia you should probably fix it.